Treasury Secretary Steven Mnuchin's fiancée will sever ties to the Hollywood business Mnuchin once headed. Louise Linton plans to step down from her position as interim CEO of Dune Entertainment, a film financing firm, according to a letter from Treasury reviewed by CNNMoney. Linton took over the top spot at Dune Entertainment earlier this year, as Mnuchin headed for Washington. News that Linton plans to resign comes two weeks after Senate Finance Committee member Ron Wyden, a Democrat, sent a letter to a Treasury ethics official questioning her role at the company. In the letter dated May 10, Wyden expressed concern that putting Linton in the CEO spot at Dune "undermined" Mnuchin's efforts to divest from the business. Wyden also questioned whether it violated the ethics agreement Mnuchin signed after he was was selected by President Trump to run Treasury. Treasury responded in a May 23 letter to Wyden, saying Linton has been serving in an "uncompensated capacity" and "has no personal financial interest in Dune Entertainment or its related entities." It also stated that Linton would resign from the CEO role once Mnuchin's divestment was complete. In his ethics agreement, Mnuchin said he plans to fully divest from Dune Entertainment and from Ratpac-Dune, a partnership Mnuchin co-founded in 2013 that has backed several prominent films, by next month. It's unclear where Mnuchin is in the process of severing those ties. Mnuchin's spokesperson did not immediately respond to requests for comment. Linton's publicist and Dune Entertainment also did not respond to inquiries from CNNMoney. This isn't the first time Mnuchin's ties to the entertainment industry have raised ethical questions. In March, Mnuchin was criticized for appearing to endorse "The Lego Batman Movie," a film produced by Dune, in an interview with Axios. He later admitted in a letter to the head of the Office of Government Ethics that he "should not have made" certain comments about the movie. 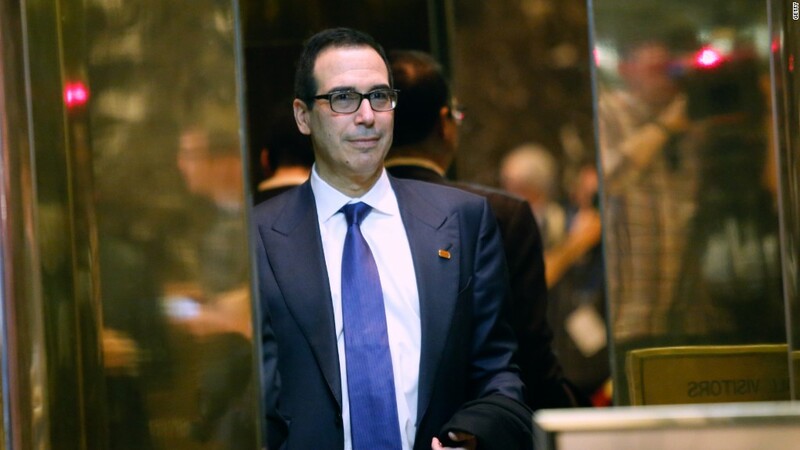 Mnuchin, a former Goldman Sachs executive, holds interests in dozens of other companies that he is divesting from. --CNN's Sandra Gonzalez contributed to this report.